Features energy-efficient, long-lasting LEDs., Self-inflates in seconds., Plugs into any 110v a/c outlet. Includes everything needed for easy set-up., Deflates down for easy storage. 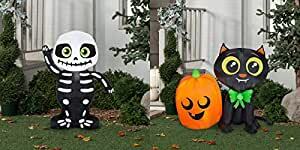 Airblown Inflatable-Cat and Pumpkin: Features energy-efficient, long-lasting LEDs, Self-inflates in seconds, Plugs into any 110v a/c outlet. Includes everything needed for easy set-up, Deflates down for easy storage. Perfect for Halloween parties, events, and outdoor decoration.